This is my updated review after one year of ownership. As much as I wanted to like this car, I must say that it has been a dissappointment. I bought it new, based on previous experience with Toyota vehicles and a good trade-in offer I got from my dealer for my previous car - my net-out-of-pocket on the RAV was ~$2-3k less than other comparable CUVs. After one year of ownership the best I can rate this car is "average". The only real positive is the amount of cargo and passenger space. In every other area the car falls short, especially comparing to competition. It's noisy, has a very stiff and uncomfortable suspension, safety ratings are mediocre (below key competitors), transmission behavior is strange and disconcerting, mileage is OK but not outstanding. Bottom line - just average. Not a bad car, but easily outclassed by several competitors in its class. The Gen.4 (2013 and later) RAV4 has very good cargo space. The cargo floor is fairly low, several inches lower that comparable small SUVs making loading of heavy objects much easier. The low cargo floor also gives you extra headroom for tall objects. The rear seats "sink" to the floor when folded, resulting in flat surface that is lower (and has more headroom) than competitors. My RAV4 is AWD and it handles great on snow and ice. I have (had) other 4WD / AWD vehicles and so far, the RAV4 has been the best. The AWD system operation si so quick and smooth that you hardly notice it's there. Crash test ratings are mediocre in spite of being a new model. 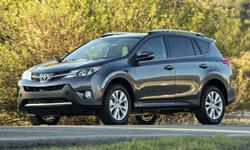 The new RAV scores 4 stars with NHTSA, while most new cars earn 5 stars. RAV also lost the Top Safety Pick rating with IIHS due to Poor score in small overlap test. It scores in the lower half and worse than most competitors. RAV4 ride / suspension is firmand rough. Ground clearance and articulation are poor, rendering it useless for any off-road use. The engine is noisy during acceleration and at low speeds. At highway speeds, wind noise level is excessive. Transmission shifting performanse is weird and disconcerting. It shifts a low, sometimes with wild swings in engine RPMs. 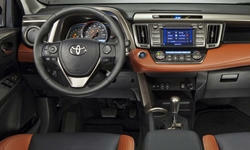 It frequently overshoots, getting to too high gear, just to downshift a second or two later. Average small SUV, not terrible, but outclassed by other vehicles in its class. Not recommended. Thank-you for this review. I am currently considering a used Toyota RAV4 or Honda CR-V in the 2010-2014 year range and I found this review very helpful.